CampbellReith was appointed by the Homes and Communities Agency to manage and coordinate the EIA for the mixed use redevelopment of this 180 hectare former MoD site, which is currently under the ownership of the HCA. The site was covered by one Masterplan creating an urban extension to Lee-on-the-Solent but was subject to two planning applications as the site crosses the boundary of Fareham Borough Council and Gosport Borough Council. CampbellReith agreed with the planning authorities that both applications could be covered by the same Environmental Statement (ES) and set up a working group with officers from both councils to make the Environmental Impact Assessment process, including scoping etc, as efficient as possible. 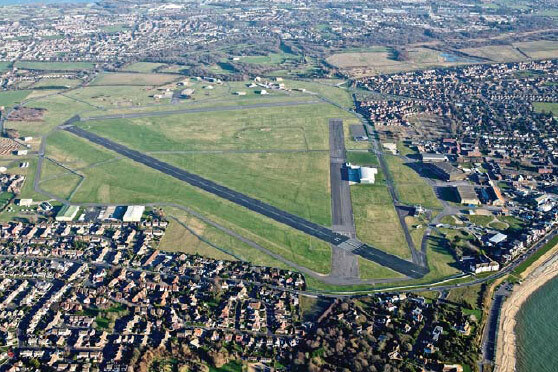 The assessments included appraising the impacts of aircraft movement on this operational airfield including air quality and in particular noise. CampbellReith scoped and managed a range of ecological surveys to inform the ES, including those for bats, badgers, reptiles and amphibians. Subconsultants were appointed from our approved database maintained under our ISO 9001, QMS system. CampbellReith also through our supply chain, have led consultations with Natural England to discuss the potential for impacts on the nearby Southampton and Solent Water Special Protection Area (SPA). Working alongside our Civil Engineering Group, SuDS features were designed to provide suitable habitat for amphibians as well as to satisfy the requirements of the Environment Agency. Other issues of particular importance included assessments of contamination and cultural heritage. CampbellReith reviewed the data from all previous intrusive investigations undertaken on the site in order to specify an appropriate remediation strategy and worked alongside the Masterplanners to ensure that the development did not affect the setting of the three Listed Buildings within the site boundary or the Daedalus Conservation Area. Both planning applications were granted unanimously at the end of March 2012 and CampbellReith continue to work alongside the HCA to bring these sites forward as part of a Marine and aviation hub demonstrating our commitment to excellent customer service.